As leading specialists in real estate we offer a comprehensive selection of properties to let, backed by a wide range of services for both the individual and corporate client. We offer all types of accommodation - apartments, villas and farmhouses with/out pool in Malta & Gozo - for short and long term, at competitive rates. Our experienced and dynamic team can assist you with all your requirements, no matter how specific or tailor-made they maybe. We offer properties to suit anyone’s budget and requirements, both inland and seafront. These vary from standard, but centrally located accommodation, to luxury and deluxe accommodation. Our website includes a comprehensive online database, which is updated daily and backed by detailed descriptions and images. At Quicklets we focus solely on letting. Our real estate agents are up to date with all the vacant property in Malta on the rental market. Malta's real estate is forever changing, apartments are being renovated and constructed constantly. The letting in Malta is at its best. Most of the newly constructed or renovated properties are finished in a modern style. Different agents specialize on different areas, so whatever type of property you want, our agents are trained to find it for you. Whether it is an apartment in Sliema, a house in Naxxar, an office in St. Julian's or a villa in Madliena. if you want to rent a property in Malta, we'll find it! For more information on renting of properties please use any of the contact details listed. Setup By Noel Saliba and Kevin and Jeffrey Buttigieg, Max Home Services is a full third party administration company that focuses on offering high quality services in condominium administration, general office administration, property managment , cleaning services , handyman services and energy performance certification. Our ethic is based on professionalism, expertise and care for our client's needs. By keeping these values as a central focus to our operation we provide solutions that meet and exceed our clients needs, be it an individual or a company. Our team brings together years of experience in a variety of fields. This partnered with our network of professional resources, both local and based abroad, not only allows us to offer the highest professional level, but also to ensure timely execution of deliverables. At SIMON Estates we are passionate and experienced about what we do. Your satisfaction is our number one priority. With a large database of properties we can find you the property in Malta you are looking for. Whether you want to buy property in Malta, or to rent property in Malta, SIMON Estates is the agency for you. SIMON Estates was voted Malta's Best Estate Agency by the Malta Business Review in 2016. Our database consists of a variety of properties, ranging from apartments in Malta, villas in Malta, house of character in Malta, farmhouses in Malta and Gozo, townhouse, bungalows etc... Want to live in the beautiful capital city of Valletta? On the market we always have property in Valletta, a city rich in history. Therefore we are sure we can find you something that fits your needs and likings perfectly. Are you visiting Malta for a holiday? We can help you find a holiday apartment in Malta. If you want to enjoy the view of the sea we can find you beautiful seafront Malta apartments with magnificent sea views. I'm here to use my knowledge to give you an expert view on the property market, and to be the match maker that finds a home that caters for all your needs. PSS Holdings Ltd. is one of the leading companies in the land development field. Established in 2005 and previously under the name of SN Properties Ltd, which was founded over two decades ago, the company has developed and constructed hundreds of residential units and commercial premises all over the Island, which were then successfully sold or leased. Developed as a joint venture with the express aim of dealing in property, PSS Holdings is proud to say that it has grown into one of Malta’s leading property contractors. Dealing in all types of property, from commercial to residential, has allowed the company to create a strong and diverse portfolio of properties all over the Island, to suit various needs and building types. The company is dedicated into making sure that their range of products are of the highest standard of quality and to the full satisfaction of our clients. Hence, they employ the best architects and civil engineers on the island and entrust building contractors with great value of experience and workmanship to undertake responsibility of all works from the design through completion and commissioning. Working with specific companies of high quality reputations, who have a high standard of work and a good team of workmen, during the last decade, has enhanced our reputation, satisfied our customers and most of all provided a product that is top quality. When it comes to professional property dealing, look no further than PSS Holdings. Ben Estates Ltd in Malta was founded by Bernard Mangion following eight years of work in various sections of the real estate business. Ben Estates is one of the fastest growing real estate organisations in Malta and Gozo. The organisation has been built on a strong foundation of a highly experienced management team, excellent partners and professionally educated sales and letting associates trained on internationally recognised real estate programmes. When buying or renting in Malta or Gozo, Ben Estate’s extensive database caters for all kinds of properties ranging from the basic necessities, to the most luxurious of homes. The team of letting consultants is highly experienced and all associates strive to meet the clients’ requirements as efficiently as possible. Ben Estates’ experienced team can assist you in searching for strategic business premises with the largest database of commercial properties available on the market. The company is always in a position to offer a wide range of choices to suit any client. Whether you’re looking for office premises, retail outlets, catering establishments, warehouses or any other type of commercial property, Ben Estates’ comprehensive database, sound knowledge and experience of our consultants is sure to offer a solution, keeping in mind your budget and requirements. For clientele looking for an investment in luxury property, Ben Estates have designated associates that specialise in this field who will assist you further and better in your search. Client satisfaction is our priority. 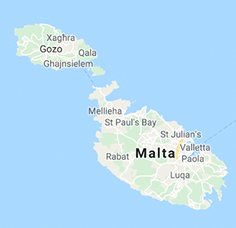 If you are relocating to Malta as an individual with a company or you are looking to set up a business in Malta, Ben Estates can point you in the right direction. We also offer property management and maintenance service on request. Ben Estates have a number of foreign clients that have opted to choose this service. Excel Homes Real Estate Ltd is a leader in up-market quality property in both Malta and Gozo. Backed by a qualified management team with years of real estate experience, the Company thrives on successfully matching buyer requirements with seller expectations. Excel Homes takes great pride in delivering services of the highest quality and the team is always ready to go the extra mile to meet clients’ objectives. The Company has successfully built a network of contacts and strategic alliances with the country’s leading banks, tax and legal firms, Government entities, financial corporations, notaries, insurance agencies, architects and civil engineers, all of whom are able to assist and streamline any processes related to real estate transactions. Excel Homes has a selective portfolio of up-market quality properties that vary from time to time. Quality does not necessarily mean expensive and luxurious. The Company seeks to enlist any type of property, from the smallest designer apartments to imposing grand palazzos. The defining factor is simply value. If the property is of any value, then it will be enlisted in the database. Excel Homes has a vision to be the real estate advisor of choice in the markets it serves and to seek out new markets and opportunities for clients and take an entrepreneurial approach to delivering value. Excel Homes Real Estate’s values capture the commitment not only to ethical, professional and responsible conduct, but also to the essence of real estate success, what is referred to as “an entrepreneurial value-embracing approach”. Andy Stowne brings together a group of seasoned, successful professionals with over 30 years of joint experience in all aspects of the Maltese Real Estate Industry, dealing mainly with sale and letting of residential, holiday and commercial property. One of our major assets is that we are supremely adept at overseeing and advising on the entire process of property acquisition. This Includes whether you wish to buy a new house or if you have property you wish to sell, we have the ability to ensure a smooth transaction. If you are interested in purchasing property in Malta, Andy Stowne is your best proposition whether you are a Maltese or a Non-Maltese resident, our team of professionals will guide and assist you all along the way. Based in Malta, Northkey is a dynamic real estate agency which specializes in property in the north of Malta. Call us now, and we'll help you find the home of your dreams. Sky Estates & Co specialize in the marketing, letting, listing, property management and selling of new and resale homes, residential communities, home sites, undeveloped land and commercial and investment opportunities. Here we maintain a full-time staff of well-trained real estate professionals who continually strive to provide top quality service for their individual clients and customers. Sky Estates is a creative, innovative and people-oriented organization providing individual opportunity, personal satisfaction and rewarding challenges to all members of the firm. Formosa Real Estate & Letting Agency is a young and energetic established company specialising in Residential and Commercial sales, long and short term leasing and valuations of property in Malta. Whether you are buying your first home or considering a second residence we can offer you a comprehensive selection of fine and tasteful properties available on the market both for sale and long let. Throughout the years we have built a strong relationship with various vendors and purchasers. As an Estate Agency we guarantee to provide our best service and offer you peace of mind through our professional and friendly approach. That is why we have managed to establish a fine reputation by providing a high level of personal service. We understand that it is a challenge for anyone to own their own home. When we build properties we keep this in mind and do our best to build properties that are modern and a joy to live in whilst not charging more than people are willing to pay. This is the secret that helps Ta Dernis thrive where others are failing.